GIVEN a choice, Tim Cone admitted he would have wanted to bring in either Marqus Blakely or Denzel Bowles as Barangay Ginebra imports for the coming PBA Commissioner's Cup. Cone won championships at Purefoods with both Blakely and Bowles, but bringing either one of them this conference to Ginebra would entail a complex process since their PBA rights are still owned by his former team. "I wish we could have brought in Marqus or Denzel, but Ginebra doesn't have their rights," said Cone on Monday in an interview with Spin.ph. With not much time to scout in the US, Cone bared that he will be bringing in former Talk 'N Text import Othyus Jeffers as Ginebra's import not only in the Commissioner's Cup but most likely for the season-ending Governors Cup as well. The wide-bodied former Washington Wizards forward had a stellar stint with Talk 'N Text in the 2014 Governors Cup before leaving the team because of complications with his NBA contract. 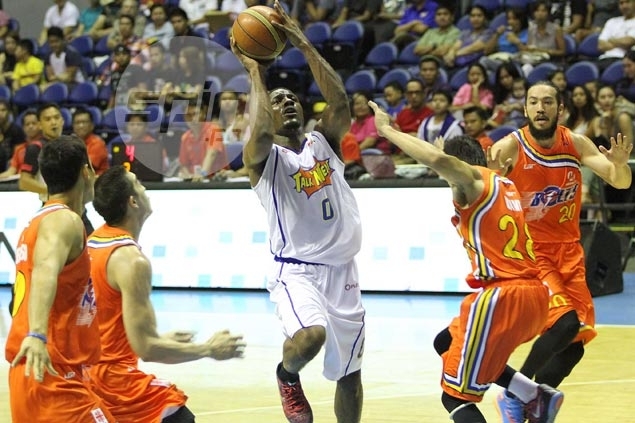 In his lone game in the PBA, Jeffers tallied 38 points, 13 rebounds and two steals to lead the Tropang Texters to a 105-99 win over Meralco on May 21, 2014. Unlike both Bowles and Blakely, Jeffers is free to sign with any PBA team other than Talk 'N Text since it has been over a year since he suited up for the Manny V. Pangilinan-owned team. Jeffers is listed generously at 6-5, well below the 6-9 import ceiling for Ginebra which went out at the quarterfinal stage in the season-opening Philippine Cup. But Cone is so confident in Jeffers' ability that he is already looking at utilizing the wingman for the two import-laden conferences of the season. "We're happy that we were able to bring in Othyus Jeffers. The plan is for him to play in both the second and third conferences since he's only 6-5," said the 18th-time champion coach. Jeffers is set to arrive on January 17, said Cone. The Commissioner's Cup is set to begin on February 10. Jeffers is an energetic wingman who played six games for the Minnesotta Timberwolves towards the end of the 2014 NBA regular season, which complicated his stint with Talk 'N Text. He was named NBA D-League co-MVP after posting averages of 20.9 points, to go with 9.9 rebounds, and 2.2 steals just before receiving a call-up from the Wolves. Curiously, the TNT stint of Jeffers in 2014 was the last recorded tour of duty for the 30 year old banger.